Microsoft offers SharePoint over the Internet in a product called SharePoint Online. With SharePoint Online, Microsoft takes care of all the heavy lifting. To get SharePoint going, someone has to procure and set up the servers, and install the operating system, databases, web server, and SharePoint server. This all has to be done in a special climate-controlled room called a data center. The data center has to be secure and redundant. After all, what if a disaster happened and the data center computers in the data center — or worse, the data center itself — were destroyed? Finally, the whole setup must be scalable so that as more users begin using SharePoint for mission-critical business processes, the servers and sites can keep up with the added load. And that isn’t the end — after everything is up and running someone still needs to manage all the updates and keep the servers humming smoothly. With a hosted solution, you or your organization are paying someone else to do all this for you, and you simply use the final product, SharePoint. With SharePoint Online, Microsoft sells its SharePoint platform as a service, so the actual servers and software run in its data centers, managed and maintained by its employees. You, being a customer of Microsoft, connect to this managed version of SharePoint over a secure channel of the Internet and use it to develop business solutions on the SharePoint platform. Microsoft is not the only company that offers SharePoint over the Internet. Other companies, such as Fpweb.net, also offer SharePoint over the Internet. SharePoint Online is the brand name for Microsoft’s offering. 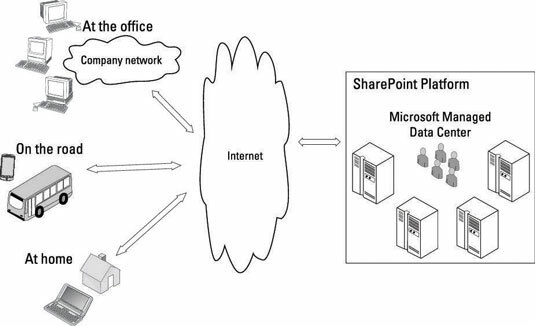 SharePoint Online is when Microsoft manages SharePoint in their data centers and you access it over the Internet. SharePoint On Premise is when your local IT gurus manage SharePoint in your company data center.